Looks like you are new to The Alliance. Before you choose a course to take CLICK HERE for instructions on how to get ready to sell – FAST – in four easy segments, with useful tips, videos and links. 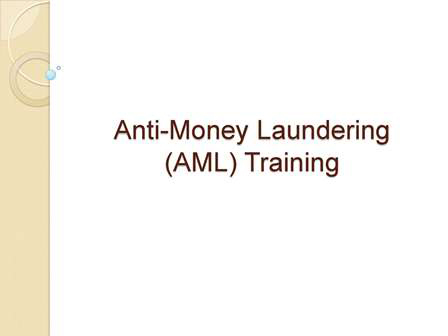 This Anti-Money Laundering course satisfies the AML requirements for most of our carriers. A copy of your certificate of completion is stored in your "My Contracts" account where it can be sent to carriers upon request. In this course, Andy Albright explains to agents and staff about various training techniques he has developed and utilized. With the advanced training found within this course, you will be able to develop yourself and your business into becoming more efficient and successful. Andy Albright has developed a simple and specific guideline in his book, The 8 Steps to Success. If you follow the plan you will quickly realize the way to gain recognition and income is to sell and hire, and teach others to sell and hire. Agents with The Alliance are measured by their performance, so it is crucial to maintain your Placement Rate. This means writing good, solid business so that your submitted business is issued and stays on your books. This course will provide you with a better understanding of your placement rate and how it is calculated. Persistency is a valuable measure of performance in the life insurance industry and at The Alliance. It is a very simple concept: Write good business that is sure to get issued, and keep that business on your books. This course will help you achieve better persistency by teaching you how to calculate it. The “Alliance Training Manual” (ATM) is unlike any other sales tool ever produced by The Alliance. It contains an easy-to-follow plan to help you sell both efficiently and effectively. It is an “income producing machine” where you can go in the home, flip through the pages and make a sale. It is a no-brainer, win/win, dummy-proof sales system that will guide you to success! Picking up the phone and dialing a complete stranger can be frightening. With the scripts, videos and training in this course you will be prepared to call leads and set appointments easily and effectively! After completing an application and leaving a client's home, you need to follow through to ensure the policy is issued and that you get paid! This course will show you easy ways to keep track of your pending apps, check their status and make sure that the policy is issued, and has free tools to help you stay organized. This course will give you the confidence, the know-how, and knowledge you need to help you recruit more and grow your residual income! If you want to grow your business and become an Agency Manager fast, then this is the course for you. In this series of videos you will gain insider information on how Andy Albrightthinks about his finances when it comes to his business. The video series provided in this course covers a wide range of topics including chargebacks, hiring staff, when to rent or purchase an office, and many more! The instructional video included in this Lead Types and Tips course will teach you all the basic information you will need to get started with leads. Once you have passed this course you will know all about our different lead types, how to get leads in your area, and how to be more efficient with your leads. Do you want to know how to properly manage your applications, get your clients protected and get paid fast? Take this course to learn how to get your applications to the carriers quickly and in good order. It provides some practical guidelines to get organized and get paid! This is a great product to offer your clients looking for an opportunity to accumulate cash value - based on market performance - for their future use. With a Guaranteed Refund Option (GRO) rider, customers can have peace of mind about the market-linked feature of an IUL policy. The Mutual of Omaha (MoO) Term Life Express (TLE) is one of the most popular products at The Alliance for mortgage term protection. This course contains instructional video on the highlights of this product and how to get a paycheck fast! Many clients are concerned about covering their funeral and burial costs. Mutual of Omaha’s product, Living Promise, is one of our top products for final expense. This course will help you become better acquainted with Living Promise, so you can protect more families and increase your income. In this course you will learn all you need to know about the Foresters Plan Right product. This is an excellent final expense product for you to offer your clients who are looking to cover their burial costs. The course will teach you step by step how this product works and how to best use it to protect your clients. Take this course to learn all about one of our top selling Term products, Foresters Strong Foundation. This is an excellent product because of its affordable rates and member benefits. CFG Safeshield is one of our top selling term life insurance products! This course includes a step by step training video featuring our very own Product Specialist, Gina Hawks. After watching this video you will be well prepared to sell and protect your clients with this excellent product! Another popular final expense products with The Alliance is CFG’s Dignified choice. It is a great product for you to help protect your clients against the high costs of a traditional funeral. This course, provides you with an informative training video from Gina Hawks, Product Specialist for The Alliance on how to best use Dignified Choice. Mutual of Omaha (MoO) Children’s Whole Life is a fantastic product to provide to clients who have children or grandchildren because it locks in a child’s insurability in case something happens to them medically in the future. The Children’s Whole Life is an inexpensive and cost effective way to provide insurance on children. Transamerica offers a variety of solutions to offset a client's funeral costs. With all of these options available, it can be confusing and difficult to understand which options you should recommend but this course will teach you about all the different solutions to Final Expense that Transamerica has to offer and when to use each one. One of the great benefits of Foresters Advantage Plus Whole Life product is that it is available in all 50 states. After taking this course, you will be ready to offer your clients a product that can cover their final expenses with the optional advantage of term insurance. Phoenix's Safe Harbor Term Life Express is unique in several ways. With Safe Harbor, your clients will have a 10 year term option, even to age 80! In most states, the policy also comes with four riders at no additional premium costs. This product is simplified issue, so your clients won't have to have a medical exam in order to qualify. This whole life product is great because it is guaranteed issue, which means NO health questions and it's approved in almost every state! This product also offers unique payment options that can help your clients who don't have bank accounts. AIG's Guaranteed Issue Whole Life Product is simple to write, process and issue. Face amounts are available from $5,000 to $25,000 and all forms and disclosures needed are included at the point of sale. Prompt submission and approval of application provides the client a policy number immediately. The FIT Secure Growth is one of our Indexed Annuities, meaning that the gains in the annuity are tied to the performance of the market. The FIT Rewards Growth is one of our Indexed Annuities, meaning that the gains in the annuity are tied to the performance of the market. The FIT Certain Income is one of our Indexed Annuities, meaning that the gains in the annuity are tied to the performance of the market. The FIT Select Income Annuity is one of our Indexed Annuities, meaning that the gains in the annuity are tied to the performance of the market. This product is suited for clients who wish to receive income from the product at some point, as the Guaranteed Lifetime Income rider is required. Be sure your client is suited for this product before writing the application. This product is suited for clients who are attracted to the immediate 3% bonus on their initial deposit. Surrender charges may apply for the first 9 years of the annuity except in cases where the withdrawal qualifies as a penalty-free withdrawal. This product is suited for clients who are wanting to maximize retirement income within the next 10 years. The Guaranteed Income Rider is required, so be sure that your client is suited for this product and wants to receive income before writing the policy. The Alliance Playbook explains who we are and how we can succeed. President and CEO of The Alliance, Andy Albright explains the details of The Playbook in this video course. Once you're accustomed to selling term and final expense policies, you may want to start digging deeper into your clients' retirement needs. In this course you will learn to help them with annuities and IULs as retirement plans. This is a great way to help clients with both their coverage and retirement needs, while also increasing your income. What is a client worth? Do you want to learn how to take one client and make an additional $25,000 a year? In “How to Create Clients for Life” will teach you how to do just that. When working with clients and their retirement plan, they may have questions about how their Social Security benefits and current plans will play into their future. This course will walk you through the basics of Social Security, Traditional IRAs and Roth IRAs and how you can use these to open up a conversation about annuities. This course discusses how to sell life insurance to federal employees. It reviews how Federal Employees' Group Life Insurance (FEGLI) works and how you can help these clients with many of our carriers’ policies. Winning managers of any sports team know their team, who is on it, and where they are positioned in the lineup. In the same way, you need to diagram your team and position your players based on their performance. GS3 is a creation of our President and CEO, Andy Albright to motivate people to make forward progress toward a goal. In this video course, Andy himself explains how to get a new agent started, goal set, and go serve with them. This annuity product has an issue age from 0-80 and offers an 8% vested bonus if the Enhanced Guaranteed Minimum Withdrawal Benefit Rider is purchased. This annuity product has a fixed interest on the account value guaranteed for 12 years. It also offers two death benefit options and a Lifetime Income Rider. This annuity product has an issue age from 0-85 and offers penalty free withdrawals for nursing home, terminal illness, unemployment and home health care. 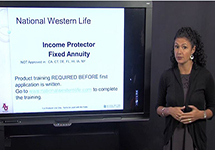 The Income Protector Annuity Product by National Western Life will provide you with an additional option to offer your clients. National Western Life’s Ultra Classic Annuity is a Fixed Indexed Flexible Premium Deferred Annuity that provides clients with easy access to their money. There are two Lifetime Income Riders available with this product as well. This course will teach you everything you need to know about National Western Life's Impact 7S Annuity. This product is a Fixed Indexed Annuity that provides clients with a 5% Premium Bonus vested over 10 years. Learning about the Impact 10 Annuity Product will provide you with an additional option to offer your clients. The Ultra Future Annuity Product from National Western Life will provide you with an additional option to offer your clients. The Protector One Annuity Product by National Western Life will provide you with an additional option to offer your clients. National Income Life provides you with two Lifetime Income Riders, Outlook and Outlook Plus 5. These can be added to the following 4 Annuity Products: Impact 7S, Impact 10, Ultra Classic and Ultra Future. This course will introduce you to the basics of index universal life, how it works, and how to explain the product to your clients. This overview will help you get a general understanding of IULs before you dive into the details of specific IUL products with The Alliance. This course will help you understand what an annuity is, how it works, who might be a suitable candidate for an annuity, and how they can benefit from it. There is also a bonus video with annuity sales tips. Take this course to learn the basics of annuities before you take our carrier-specific annuity courses. This course is your guide to understanding this advanced life insurance product, and better serve your clients who are looking for a safe place for their money to grow tax deferred in order for them to receive a set income amount for the rest of their lives! The F&G Index Universal Life Course will help you understand this advanced life insurance product and help clients who want to purchase life insurance with the purpose of saving and growing a tax-free retirement with no market risk! You will find the Phoenix Personal Protection Choice Annuity a very attractive product to offer your clients. You will find it best suited for clients who are interested in guaranteed lifetime income. In this course, Gina Hawks will walk you through the details of Phoenix's Personal Income Annuity product and the riders available for a lifetime income. This product is best for clients who are worried about outliving their financial resources and are interested in a guaranteed lifetime income when they retire. TransAmerica's TransNavigator is a great indexed universal life policy that is usually used as a tax-free retirement vehicle. This course discusses all of the riders TransNavigator has to offer, but provides an in-depth training on the Long Term Care Rider because it has special underwriting and licensing requirements. Mutual of Omaha’s Guaranteed Advantage is a unique product as it is Accidental Death Insurance. Guaranteed Advantage is an excellent and inexpensive product that will give your client additional coverage that will pay in the result of death by an accident. Mutual of Omaha's Guaranteed Universal Life Express (sometimes abbreviated GULE)means that Mutual of Omaha guarantees your client's coverage as long as the minimum no lapse premium is paid for the agreed upon amount of time. The product is unique because it's flexible and can provide the permanent coverage of whole life, but at a low premium usually associated with term life. Baltimore Generation Legacy is a great product for older clients who would like to give their wealth to their children or grandchildren without having to pay heavy taxes. Baltimore Life's Secure Solutions single premium whole life policy is great for people who have some extra money they'd like to set aside for their heirs. There are no-cost riders they can use if they become terminally ill, are confined to a nursing home, or need a form of home health care. Phoenix Personal Retirement Choice is another great annuity product for your client's retirement needs. It offers a bonus of 8, 12 or 15%, depending on the client's home state. There is a Lifetime Income Benefit Rider available for this product, so it's great for clients who don't want to outlive their financial resources. This index universal life product is great because it has so may options for your clients. They can choose from a wide array of riders, enjoy ease of underwriting and have the ability to adjust their coverage and premiums to meet their changing needs.